As a former admissions director, I know first-hand the hard work and expense associated with getting candidates to consider your school. Once you have their attention, it’s equally important to have an admissions checklist and workflow to drive prospective students through the enrollment funnel and into your school’s decision set. Let’s explore the ways you can maximize online checklists in a student enrollment system to benefit both candidate families and your admissions office. 1. Rethink the parent experience. Admissions checklists require a delicate balance: How much of the heavy lifting do we place on parents? How much do we put on our admissions office? For example, in the past I have published a 10- to 12-page admissions application that encompassed everything our school needed from the family. It wasn’t until I went through the process with my own children that I realized how daunting the application was. As a result, I started rethinking the parent experience. Why not breakdown the application and create additional checklist steps filled with quick requests/forms that are easy for the family to complete? Instead of a stressful, pressure-filled and lengthy application, families will benefit from a sense of progress as they check off each item. Through Blackbaud Enrollment Management System™, they were able to review the checklist progress at any time on their phone, keeping the finish line in sight. The new approach also benefited our admissions staff by significantly reducing the hours spent combing through hundreds of lengthy applications. They quickly reviewed the shortened applications and the completed checklist items as they came in, which gave our team more time to spend with candidate families to learn about the decision factors most important to them. Best of all, we learned earlier in the admissions process whether our school would be a good fit for the family, saving everyone time if the match wasn’t right. 2. Understand the psychology of recruiting. While our admissions process only required three items—the application, current school records, and entrance test scores—we increased attendance at open house events, parent coffees with the head of school, and tours by adding these as items on the checklist. Because the events appeared on the list with a checkbox next to it, most families believed they should complete the items. 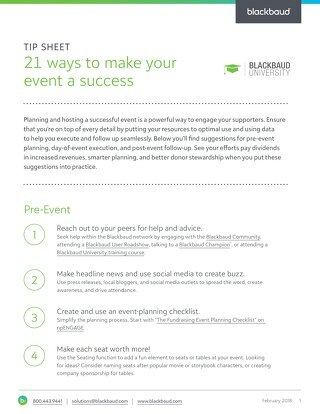 Having events on our online enrollment system checklist also enabled us to become more powerful marketers by setting up triggers to send email invites and reminders. In doing so, we were able to leverage the phenomenon of the fear of missing out (FOMO) to further drive attendance. After each event, we emailed a thank you before they even left the parking lot to keep our school top of mind. For families that were slow to engage, the expanded checklist gave us more opportunity to connect with those who had not attended by sharing information that was presented at the event. 3. The power of data. By operating an expanded checklist online, we captured admissions data from each season that factored into our decision making for the following year. The data showed us the attendance at each event as well as their enrollment decision. This enabled us to review the information being presented at events with a low-enrollment yield and ask ourselves what we needed to change to make it a high-yield event. We also began creating “success profiles” based upon multiple checklist items and analyzing these against the demographic data (gender, entering grade, sending school, zip codes, test scores, etc.). These success profiles were used to create forecast models for future years. 4. The smaller, the better. I’ve heard the argument, “My school is too small to worry about all these factors!” On the contrary, small schools with limited resources need the efficiencies of an online checklist as much, if not more than, larger schools. By expanding the checklist, you’ll increase the documents and events that get processed with a candidate’s name, which will enable you to remember more about the candidate and improve your interactions. As a result, families will be impressed by your small school difference. At my former school, we were in a market with dwindling parochial school enrollments, state-ranked public school systems, and 15 other private schools competing for the same pool of candidates. 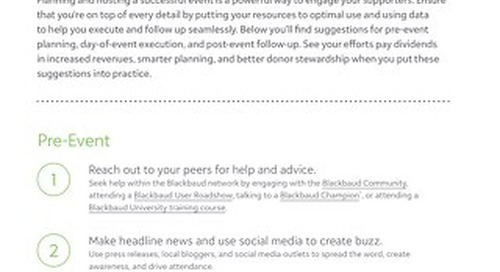 By taking our admissions system online with Blackbaud and expanding our checklist, we increased candidate engagement. You can, too. Download this document above to learn more ways your school can improve candidate communication and admission office efficiency. Charlie is a technical solutions engineer for Blackbaud’s K–12 Team. He began his career at Blackbaud in October of 2018 after spending the previous eight years at Archbishop Moeller High School. While at Moeller, Charlie was the director of admissions for five years after working three years in the technology department. Prior to Moeller, Charlie was a sales, marketing, product, and brand professional in the retail, eyeglass, construction, and building products industries.